When would you like to stay at YHA Bridges? The tranquil retreat of YHA Bridges has been described as one of the last remaining rural idylls. You can enjoy a traditional hostelling experience at this former village school, set within the wonderful landscape of the Shropshire Hills AONB. YHA Bridges has, since May 1931, made a lovely base for walkers and cyclists. Our hostel includes a cosy lounge with an open fire. Enjoy a choice of our home-cooked three course evening meals with ingredients from our fruit and vegetable garden served at 7pm, for £12.50, book direct with the hostel. 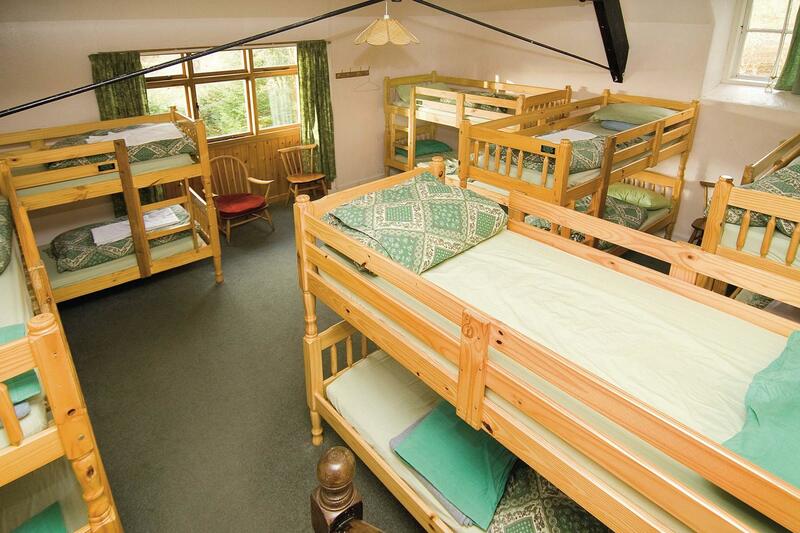 This 38 bed Youth Hostel has private and en-suite rooms available as well as camping facilities. The are 2 x 4 bed en-suite rooms, 1 x 6 or 8 bed, 1 x10 and 1 x 12 bed room. A traditional hostel experience set in the most beautiful, wild landscape. For those adventurers and keen explorers, the hostel provides a perfect camp with free parking, modern utilities and a great local pub next door. Travelling to the hostel over the Burway road in the winter is not advised. The Shropshire Way passes right by the hostel so lace up your boots and explore. You'll find the distinctive quartzite hills of Stiperstones and the Snailbeach mines to the west. Don't miss The Bog visitor centre which is housed in one of the last remaining buildings of a lost lead mining village. Indulge in a slice of their famous 'Bog Bake' cake while you're there! Or go east from the hostel to enjoy the heathland plateau of Long Mynd with its picturesque valleys. You'll always want to pay a visit to local market towns Bishops Castle, Church Stretton and Ludlow; they all have their share of book, bicycle and coffee shops! The Bridges is a great location for activity breaks or a gentler bird-watching holiday - the whole area is a nature reserve where birdlife thrives. Come summer time, the air is filled with the song of skylark as well as the distinctive call of the red grouse - which, interestingly, can't be found further south than here. Evening meals are available at YHA Bridges and camping is available if you bring a tent. After a day exploring in the hills, you'll have built up a healthy appetite. You can enjoy a meal at the hostel and follow it up with a pint at The Bridges country pub next door! Utilising our vegetable patch, hearty meals are available in the evenings. Three courses with tea and coffee will usually amount to £12.50. Personalised menus can be made for pre-booked groups for vegetarians and those with special dietary requirements. We also serve a delicious breakfast for £6 and a packed lunch is available for £5. The finest and best preserved fortified Medieval manor house in England. Set in peaceful countryside near the Welsh border. Parking: There is free parking on-site. The hostel takes its name from the three bridges which span the East Onny River and Darnford Brook. It was built as a village school in 1866, commissioned by Lady Scott, Lady of the Manor of Wetnor and Ratlinghope. She built the school for the children of her employees, seeking to encourage her workers to stay with her, rather than join the drift to the factories of Industrial England. The stone for the building came mainly from a local quarry near Norbury, though some of the windowsills are of Cotswold stone. The bell-tower is still standing, but it has lost its pointed top and the original bell, soon to be re-built. The back of the building was originally the school teacher’s house, the school rooms, divided by glass partitions, being at the front. The building did not survive long as a school - there were not enough children in the area - and for a while it was left largely unused. In 1931 it became a Youth Hostel, making it one of the oldest in the country. It appeared in the first English handbook. Until 1968 the toilets were ‘holes in the ground’ and washing was done in the stream. An old Hostel duty was to hand-pump water from the stream into the Hostel. In the summer of 1991 the Bridges came into the ownership of Michael Boulton. It has since been run in a traditional manner, intentionally sustaining those elements that have made it so popular whilst bringing the facilities more closely in tune with modern experiences. Manager Mick recommends: Just relax and enjoy walking in the peace and quiet of this beautiful area, before returning to the comfort of your tranquil rural retreat.